» What stop sign, where? In other news, if you’ve heard all you want to hear today about our independence, how about this: Some stop signs virtually invite drivers to run them because the signs are invisible from a distance. If you want an example, take the intersection of Calapooia Street and 12th Avenue in Albany, pictured here. Going south on Calapooia the other day, I recently ran that sign. When I eventually did see it and slammed on the brakes, I ended up in the middle of the intersection. Luckily, it’s a four-way stop and, in any case, nobody else was around. Albany is a Tree City USA and justifiably proud of it. But maybe we could take a look at trees that have gotten a little too exuberant in the growth department. Trees are not the only items that block drivers’ sight lines at city intersections, especially if you’re driving a little car and sit close to the ground. 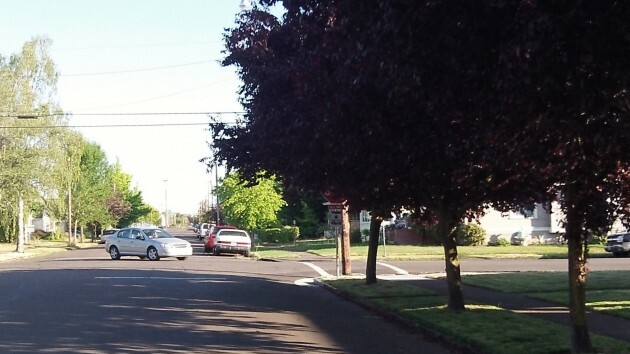 Landscaping in the parking strips and cars parked close to the corner often require drivers to nose way past the painted line even at stop signs they have seen and observed.